Paneer Capsicum Curry is a delicious and easy to make side dish for rotis, naans or parathas. It can also be served with fried rice, pulaos or plain steamed rice too. Ideal for lunch or dinner. Heat a large pan/kadai under medium heat. Add a tablespoon of butter and roast the ingredients given for masala powder. Cool down completely and grind them to fine powder. 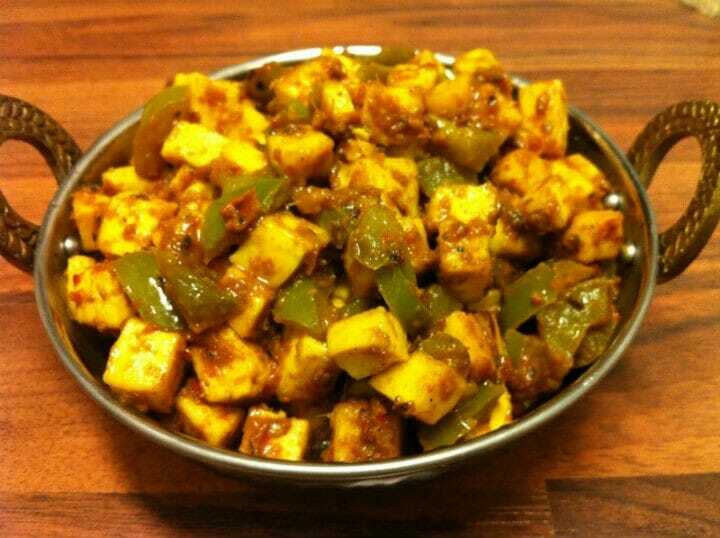 Fry the paneer and capsicum cubes until soft and keep it aside. To the same pan, add the chopped onion, ginger garlic paste and saute well. Add the mint leaves and coriander leaves. Add the masala powder, turmeric powder, chilli powder and needed salt. Mix together and cook until a nice aroma. Add the chopped tomatoes and cook until everything cooks well and form a gravy. Add the whisked curd and the cashew paste. Cook until the oil gets released from the gravy. If needed, add water and adjust the gravy consistency. Add the cooked paneer and capsicum. Mix gently. Add the fresh cream and cook for 5 minutes. This dish is an excellent combination with roti/naan. Feel free to comment or share your thoughts on this Paneer Capsicum Curry Recipe from Awesome Cuisine.